Residents and businesses on a rundown estate have voted massively in favour of their homes being demolished. 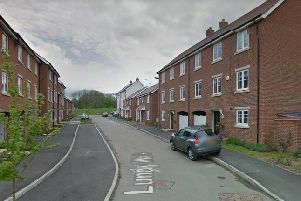 The ballot about the fate of Serpentine Court on the Lakes estate was the first to the held under the council’s £1 billion regeneration scheme. Open only to the householders and businesses occupying Serpentine Court, it generated a huge 85 per cent turnout. And a resounding 93 per cent of people voted for option three - the demolition of the entire all 199 existing properties, followed by the building of around 400 new homes. The cost of this will be £75.3mil, says MK Council. All the affected tenants will be given a new home to rent. It is still not clear what will happen to home owners, though the council has promised no resident will be “out of pocket” over the regeneration. The ballot took place on Friday and Saturday and the results were read out on Saturday afternoon. Cllr Long said:“There was enormous joy amongst the residents. But some people who live elsewhere on the estate had complained the ballot was unfair because they were not allowed to vote on an issue that affects the entire area. Residents eligible to vote were asked to choose one of three options. The first was no regeneration at all on Serpentine Court. This would cost the council £5.8 million over next 30 years. The second was partial regeneration, with a cost of £73.2 million. And the third was full demolition and building twice as many new homes. Councillor Nigel Long said: “I worked at Serpentine Court, when I first came to Bletchley in 1983. I am passionately committed to seeing the ballot decision turned into reality. Council leader Pete Marland thanked everybody involved in the ballot and promised MK Council will support residents through the demolition process.